Download "QUOTE TODAY! AG Select-a-Term. 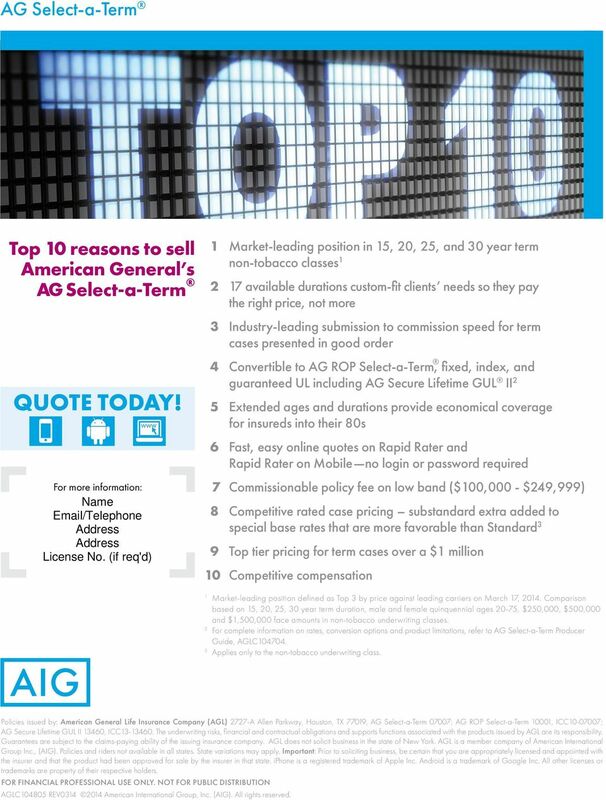 Top 10 reasons to sell American General s. AG Select-a-Term"
1 AG Select-a-Term Top 10 reasons to sell American General s AG Select-a-Term QUOTE TODAY! For more information: www 1 Market-leading position in 15, 20, 25, and 30 year term non-tobacco classes available durations custom-fit clients needs so they pay the right price, not more 3 Industry-leading submission to commission speed for term cases presented in good order 4 Convertible to AG ROP Select-a-Term, fixed, index, and guaranteed UL including AG Secure Lifetime GUL II 2 5 Extended ages and durations provide economical coverage for insureds into their 80s 6 Fast, easy online quotes on Rapid Rater and Rapid Rater on Mobile no login or password required 7 Commissionable policy fee on low band ($100,000 - $249,999) 8 Competitive rated case pricing substandard extra added to special base rates that are more favorable than Standard 3 9 Top tier pricing for term cases over a $1 million 10 Competitive compensation 1 Market-leading position defined as Top 3 by price against leading carriers on March 17, Comparison based on 15, 20, 25, 30 year term duration, male and female quinquennial ages 20-75, $250,000, $500,000 and $1,500,000 face amounts in non-tobacco underwriting classes. 2 For complete information on rates, conversion options and product limitations, refer to AG Select-a-Term Producer Guide, AGLC Applies only to the non-tobacco underwriting class. Policies issued by: American General Life Insurance Company (AGL) 2727-A Allen Parkway, Houston, TX 77019, AG Select-a-Term 07007; AG ROP Select-a-Term 10001, ICC ; AG Secure Lifetime GUL II 13460, ICC The underwriting risks, financial and contractual obligations and supports functions associated with the products issued by AGL are its responsibility. Guarantees are subject to the claims-paying ability of the issuing insurance company. AGL does not solicit business in the state of New York. AGL is a member company of American International Group Inc., (AIG). Policies and riders not available in all states. State variations may apply. Important: Prior to soliciting business, be certain that you are appropriately licensed and appointed with the insurer and that the product had been approved for sale by the insurer in that state. iphone is a registered trademark of Apple Inc. Android is a trademark of Google Inc. All other licenses or trademarks are property of their respective holders. FOR FINANCIAL PROFESSIONAL USE ONLY. NOT FOR PUBLIC DISTRIBUTION AGLC REV American International Group, Inc. (AIG). All rights reserved. 2 17-year term closes the sale Problem A retired, successful businessman age 70 (Standard Non-tobacco), with millions in cash and assets, seeking a $5 million term life insurance policy for estate liquidity protection for his wife in the event of his premature death. Solution Before Retired successful businessman, age 70 Seeking a $5 million death benefi t BGA suggested a 15 or 20 year term policy 15 year term was too short 20 year term premiums too high After Adjusted coverage to 17-year term policy $5 million death benefi t $130,664 premiums per year Savings of $356,150 over the life of the policy After thoroughly reviewing the clients situation, the Brokerage General Agent (BGA) determined that AG Select-a-Term would help to meet the client s planning objectives. BGA suggested a 15 or a 20 year term policy. Client thought the premiums on a 20 year term were too high, while the 15 year duration was too short. BGA therefore adjusted the coverage to a 17 year AG Select-a-Term policy to better meet the client s need. 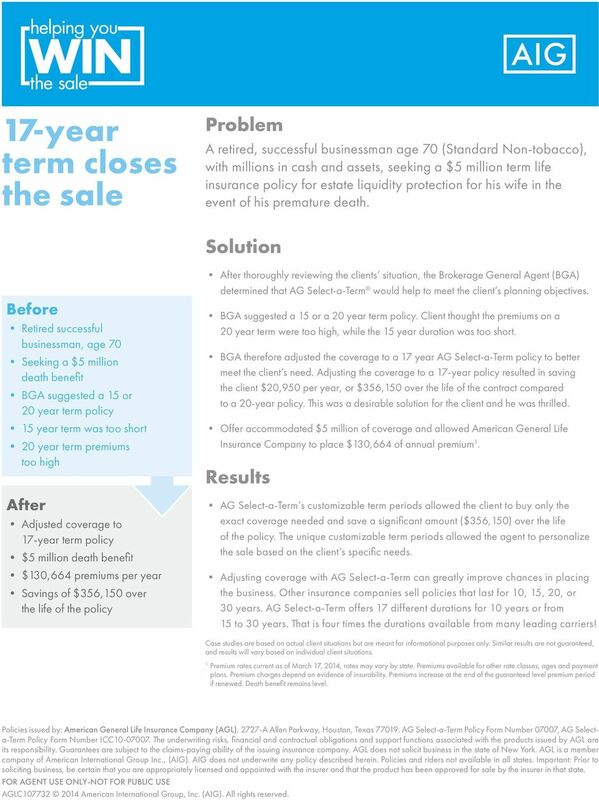 Adjusting the coverage to a 17-year policy resulted in saving the client $20,950 per year, or $356,150 over the life of the contract compared to a 20-year policy. This was a desirable solution for the client and he was thrilled. Offer accommodated $5 million of coverage and allowed American General Life Insurance Company to place $130,664 of annual premium 1. Results AG Select-a-Term s customizable term periods allowed the client to buy only the exact coverage needed and save a signifi cant amount ($356,150) over the life of the policy. The unique customizable term periods allowed the agent to personalize the sale based on the client s specifi c needs. Adjusting coverage with AG Select-a-Term can greatly improve chances in placing the business. Other insurance companies sell policies that last for 10, 15, 20, or 30 years. AG Select-a-Term offers 17 different durations for 10 years or from 15 to 30 years. That is four times the durations available from many leading carriers! Case studies are based on actual client situations but are meant for informational purposes only. Similar results are not guaranteed, and results will vary based on individual client situations. 1 Premium rates current as of March 17, 2014, rates may vary by state. Premiums available for other rate classes, ages and payment plans. Premium charges depend on evidence of insurability. Premiums increase at the end of the guaranteed level premium period if renewed. Death benefi t remains level. Policies issued by: American General Life Insurance Company (AGL), 2727-A Allen Parkway, Houston, Texas AG Select-a-Term Policy Form Number 07007, AG Selecta-Term Policy Form Number ICC The underwriting risks, fi nancial and contractual obligations and support functions associated with the products issued by AGL are its responsibility. Guarantees are subject to the claims-paying ability of the issuing insurance company. AGL does not solicit business in the state of New York. AGL is a member company of American International Group Inc., (AIG). AIG does not underwrite any policy described herein. Policies and riders not available in all states. Important: Prior to soliciting business, be certain that you are appropriately licensed and appointed with the insurer and that the product has been approved for sale by the insurer in that state. 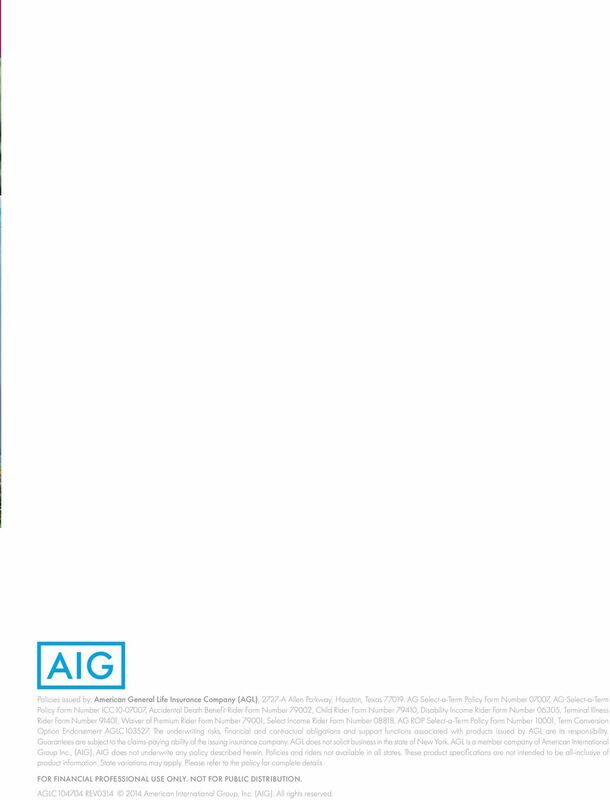 FOR AGENT USE ONLY-NOT FOR PUBLIC USE AGLC American International Group, Inc. (AIG). All rights reserved. 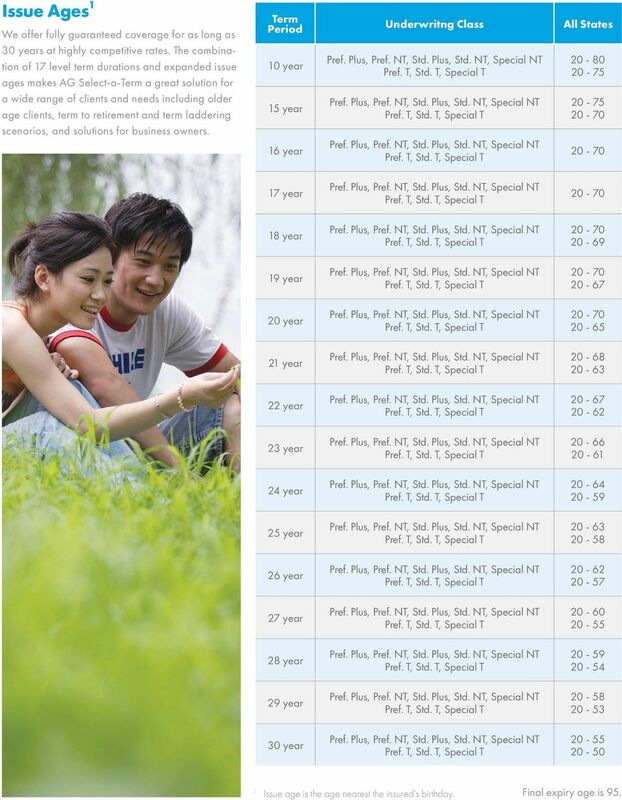 3 AG Select-a-Term CONSUMER Guide Level-Premium Term Insurance with 10-, 15-, 16-, 17-, 18-, 19-, 20-, 21-, 22-, 23-, 24-, 25-, 26-, 27-, 28-, 29- and 30- Year Term Periods Pricing effective March 17, Policies issued by: American General Life Insurance Company FOR FINANCIAL PROFESSIONAL USE ONLY. NOT FOR PUBLIC DISTRIBUTION. 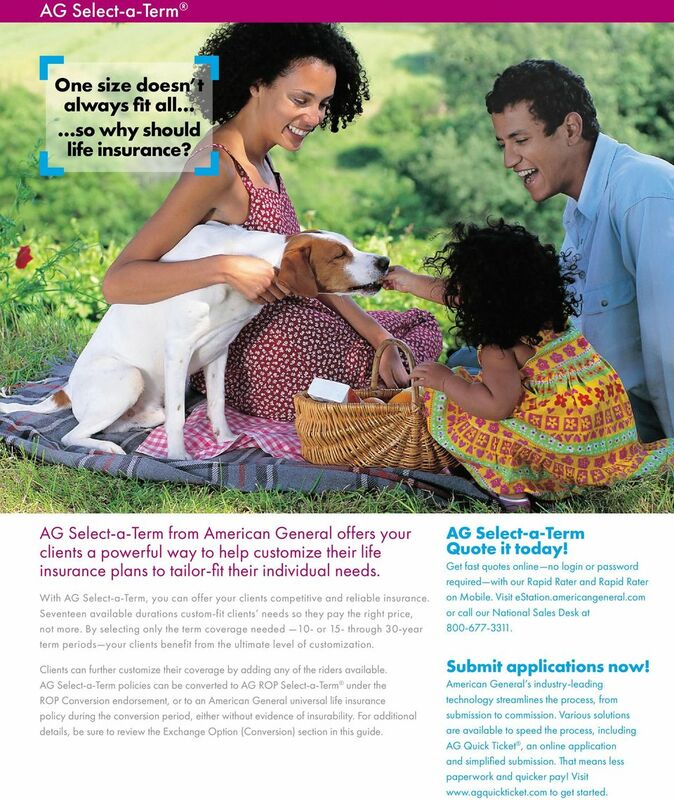 4 AG Select-a-Term One size doesn t always fit all so why should life insurance? AG Select-a-Term from American General offers your clients a powerful way to help customize their life insurance plans to tailor-fit their individual needs. With AG Select-a-Term, you can offer your clients competitive and reliable insurance. Seventeen available durations custom-fit clients needs so they pay the right price, not more. By selecting only the term coverage needed 10- or 15- through 30-year term periods your clients benefit from the ultimate level of customization. Clients can further customize their coverage by adding any of the riders available. AG Select-a-Term policies can be converted to AG ROP Select-a-Term under the ROP Conversion endorsement, or to an American General universal life insurance policy during the conversion period, either without evidence of insurability. For additional details, be sure to review the Exchange Option (Conversion) section in this guide. AG Select-a-Term Quote it today! Get fast quotes online no login or password required with our Rapid Rater and Rapid Rater on Mobile. Visit estation.americangeneral.com or call our National Sales Desk at Submit applications now! American General s industry-leading technology streamlines the process, from submission to commission. Various solutions are available to speed the process, including AG Quick Ticket, an online application and simplified submission. That means less paperwork and quicker pay! Visit to get started. 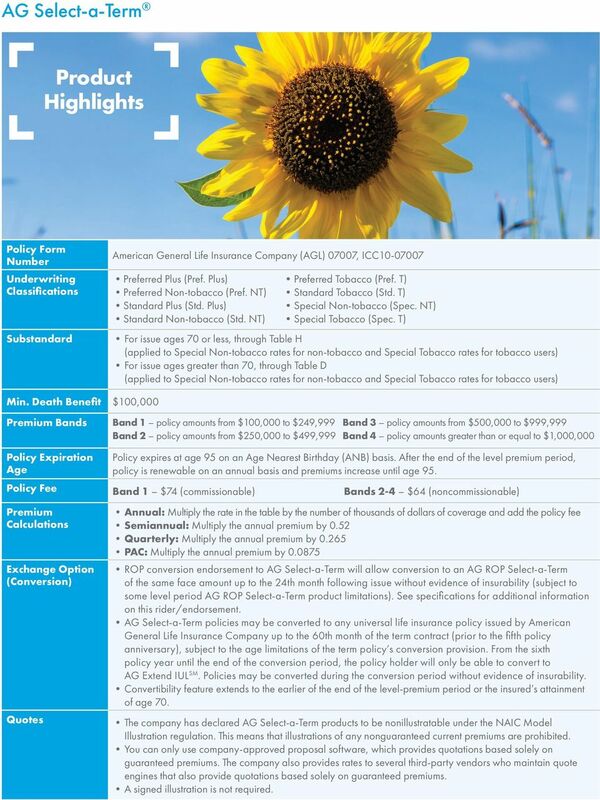 5 AG Select-a-Term Product Highlights Policy Form Number Underwriting Classifications Substandard American General Life Insurance Company (AGL) 07007, ICC Preferred Plus (Pref. Plus) Preferred Tobacco (Pref. T) Preferred Non-tobacco (Pref. NT) Standard Tobacco (Std. T) Standard Plus (Std. Plus) Special Non-tobacco (Spec. NT) Standard Non-tobacco (Std. NT) Special Tobacco (Spec. T) For issue ages 70 or less, through Table H (applied to Special Non-tobacco rates for non-tobacco and Special Tobacco rates for tobacco users) For issue ages greater than 70, through Table D (applied to Special Non-tobacco rates for non-tobacco and Special Tobacco rates for tobacco users) Min. 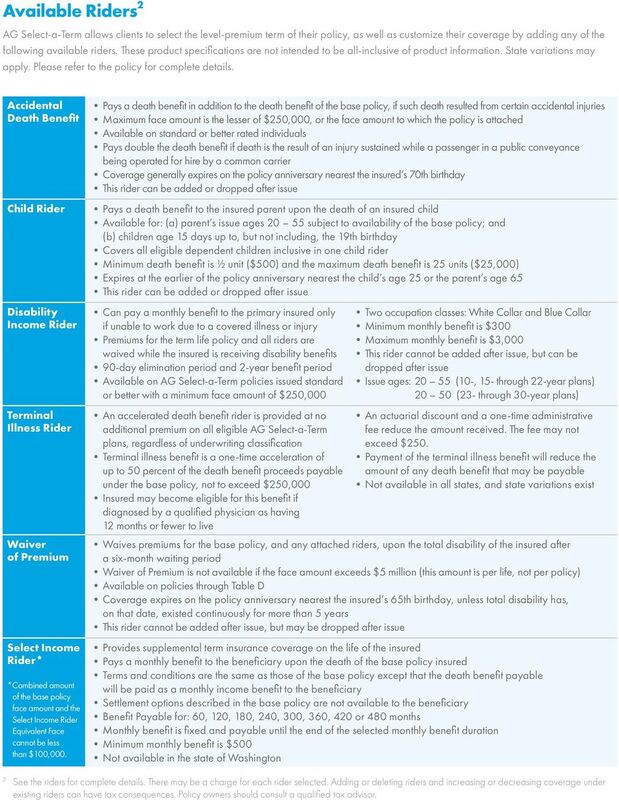 Death Benefit $100,000 Premium Bands Band 1 policy amounts from $100,000 to $249,999 Band 3 policy amounts from $500,000 to $999,999 Band 2 policy amounts from $250,000 to $499,999 Band 4 policy amounts greater than or equal to $1,000,000 Policy Expiration Age Policy expires at age 95 on an Age Nearest Birthday (ANB) basis. After the end of the level premium period, policy is renewable on an annual basis and premiums increase until age 95. Policy Fee Band 1 $74 (commissionable) Bands 2-4 $64 (noncommissionable) Premium Calculations Exchange Option (Conversion) Quotes Annual: Multiply the rate in the table by the number of thousands of dollars of coverage and add the policy fee Semiannual: Multiply the annual premium by 0.52 Quarterly: Multiply the annual premium by PAC: Multiply the annual premium by ROP conversion endorsement to AG Select-a-Term will allow conversion to an AG ROP Select-a-Term of the same face amount up to the 24th month following issue without evidence of insurability (subject to some level period AG ROP Select-a-Term product limitations). See specifications for additional information on this rider/endorsement. AG Select-a-Term policies may be converted to any universal life insurance policy issued by American General Life Insurance Company up to the 60th month of the term contract (prior to the fifth policy anniversary), subject to the age limitations of the term policy s conversion provision. From the sixth policy year until the end of the conversion period, the policy holder will only be able to convert to AG Extend IUL SM. Policies may be converted during the conversion period without evidence of insurability. Convertibility feature extends to the earlier of the end of the level-premium period or the insured s attainment of age 70. The company has declared AG Select-a-Term products to be nonillustratable under the NAIC Model Illustration regulation. This means that illustrations of any nonguaranteed current premiums are prohibited. You can only use company-approved proposal software, which provides quotations based solely on guaranteed premiums. The company also provides rates to several third-party vendors who maintain quote engines that also provide quotations based solely on guaranteed premiums. A signed illustration is not required. 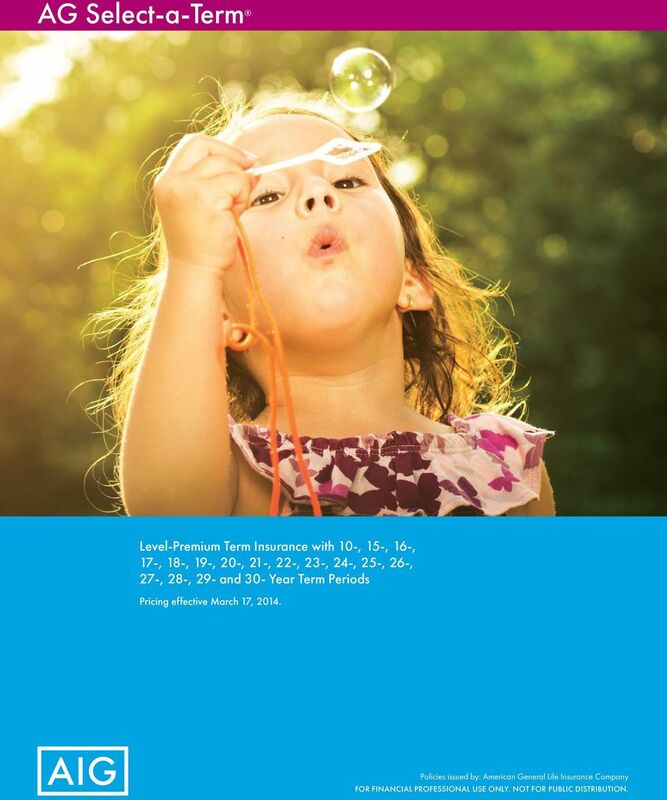 6 Issue Ages 1 We offer fully guaranteed coverage for as long as 30 years at highly competitive rates. The combination of 17 level term durations and expanded issue ages makes AG Select-a-Term a great solution for a wide range of clients and needs including older age clients, term to retirement and term laddering scenarios, and solutions for business owners. Term Period 10 year 15 year 16 year Underwritng Class All States year 18 year year year year year year year year year year year year year Issue age is the age nearest the insured s birthday. Final expiry age is 95. 7 Available Riders 2 AG Select-a-Term allows clients to select the level-premium term of their policy, as well as customize their coverage by adding any of the following available riders. These product specifications are not intended to be all-inclusive of product information. State variations may apply. Please refer to the policy for complete details. Accidental Death Benefit Child Rider Disability Income Rider Terminal Illness Rider Waiver of Premium Select Income Rider* *Combined amount of the base policy face amount and the Select Income Rider Equivalent Face cannot be less than $100,000. Pays a death benefit in addition to the death benefit of the base policy, if such death resulted from certain accidental injuries Maximum face amount is the lesser of $250,000, or the face amount to which the policy is attached Available on standard or better rated individuals Pays double the death benefit if death is the result of an injury sustained while a passenger in a public conveyance being operated for hire by a common carrier Coverage generally expires on the policy anniversary nearest the insured s 70th birthday This rider can be added or dropped after issue Pays a death benefit to the insured parent upon the death of an insured child Available for: (a) parent s issue ages subject to availability of the base policy; and (b) children age 15 days up to, but not including, the 19th birthday Covers all eligible dependent children inclusive in one child rider Minimum death benefit is ½ unit ($500) and the maximum death benefit is 25 units ($25,000) Expires at the earlier of the policy anniversary nearest the child s age 25 or the parent s age 65 This rider can be added or dropped after issue Can pay a monthly benefit to the primary insured only if unable to work due to a covered illness or injury Premiums for the term life policy and all riders are waived while the insured is receiving disability benefits 90-day elimination period and 2-year benefit period Available on AG Select-a-Term policies issued standard or better with a minimum face amount of $250,000 An accelerated death benefit rider is provided at no additional premium on all eligible AG Select-a-Term plans, regardless of underwriting classification Terminal illness benefit is a one-time acceleration of up to 50 percent of the death benefit proceeds payable under the base policy, not to exceed $250,000 Insured may become eligible for this benefit if diagnosed by a qualified physician as having 12 months or fewer to live Two occupation classes: White Collar and Blue Collar Minimum monthly benefit is $300 Maximum monthly benefit is $3,000 This rider cannot be added after issue, but can be dropped after issue Issue ages: (10-, 15- through 22-year plans) (23- through 30-year plans) An actuarial discount and a one-time administrative fee reduce the amount received. The fee may not exceed $250. Payment of the terminal illness benefit will reduce the amount of any death benefit that may be payable Not available in all states, and state variations exist Waives premiums for the base policy, and any attached riders, upon the total disability of the insured after a six-month waiting period Waiver of Premium is not available if the face amount exceeds $5 million (this amount is per life, not per policy) Available on policies through Table D Coverage expires on the policy anniversary nearest the insured s 65th birthday, unless total disability has, on that date, existed continuously for more than 5 years This rider cannot be added after issue, but may be dropped after issue Provides supplemental term insurance coverage on the life of the insured Pays a monthly benefit to the beneficiary upon the death of the base policy insured Terms and conditions are the same as those of the base policy except that the death benefit payable will be paid as a monthly income benefit to the beneficiary Settlement options described in the base policy are not available to the beneficiary Benefit Payable for: 60, 120, 180, 240, 300, 360, 420 or 480 months Monthly benefit is fixed and payable until the end of the selected monthly benefit duration Minimum monthly benefit is $500 Not available in the state of Washington 2 See the riders for complete details. There may be a charge for each rider selected. Adding or deleting riders and increasing or decreasing coverage under existing riders can have tax consequences. Policy owners should consult a qualified tax advisor. 8 Policies issued by: American General Life Insurance Company (AGL), 2727-A Allen Parkway, Houston, Texas AG Select-a-Term Policy Form Number 07007, AG Select-a-Term Policy Form Number ICC , Accidental Death Benefit Rider Form Number 79002, Child Rider Form Number 79410, Disability Income Rider Form Number 06305, Terminal Illness Rider Form Number 91401, Waiver of Premium Rider Form Number 79001, Select Income Rider Form Number 08818, AG ROP Select-a-Term Policy Form Number 10001, Term Conversion Option Endorsement AGLC The underwriting risks, financial and contractual obligations and support functions associated with products issued by AGL are its responsibility. Guarantees are subject to the claims-paying ability of the issuing insurance company. AGL does not solicit business in the state of New York. AGL is a member company of American International Group Inc., (AIG). AIG does not underwrite any policy described herein. Policies and riders not available in all states. These product specifications are not intended to be all-inclusive of product information. State variations may apply. Please refer to the policy for complete details FOR FINANCIAL PROFESSIONAL USE ONLY. NOT FOR PUBLIC DISTRIBUTION. AGLC REV American International Group, Inc. (AIG). All rights reserved. AG Select-a-Term 17 Term Periods Protection tailored to your needs.